The Target dollar section is one of my all-time favorite places to go looking whenever I’m in a shopping mood, and I believe that it’s completely underrated. I find anything from stationery to baskets and jars to candles, home decor, and gifts there! Because it can be so hit-or-miss and they don’t usually restock the seasonal items, I try to frequent the section at least every two weeks or so to not miss anything. I stopped by a few weeks ago with my roommates to look for some holiday decorations, and I couldn’t resist grabbing a few of the most unique copper and wood jars (and a few other things… Like I said, I can’t resist). 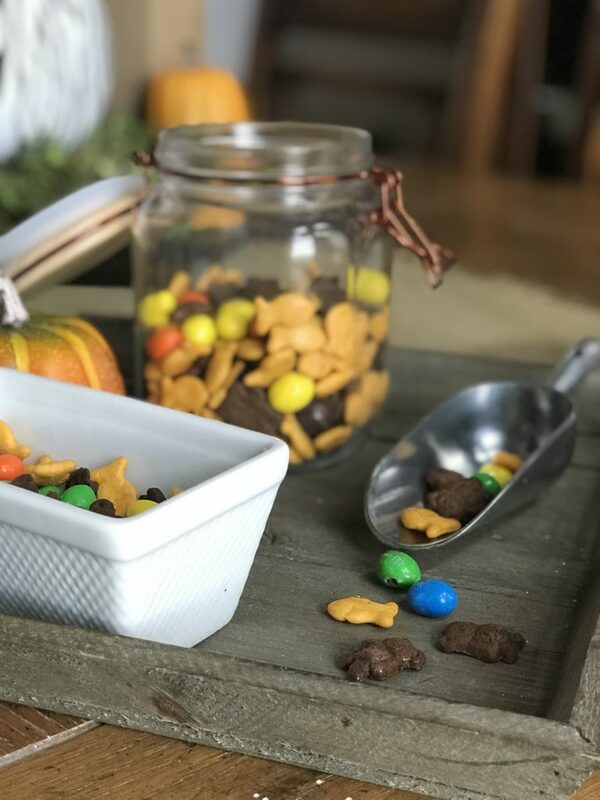 I didn’t know what I was going to do with them at the time, but after a little thinking, I decided to use them to hold my fall snack mix, which actually checks an item off of my fall bucket list! I’ve been itching to make this snack mix to get myself more into the holiday spirit, and I have to say, I was very pleased! I ended up going for a very simple mix, but it’s so customizable, the possibilities are literally endless at what you could add! 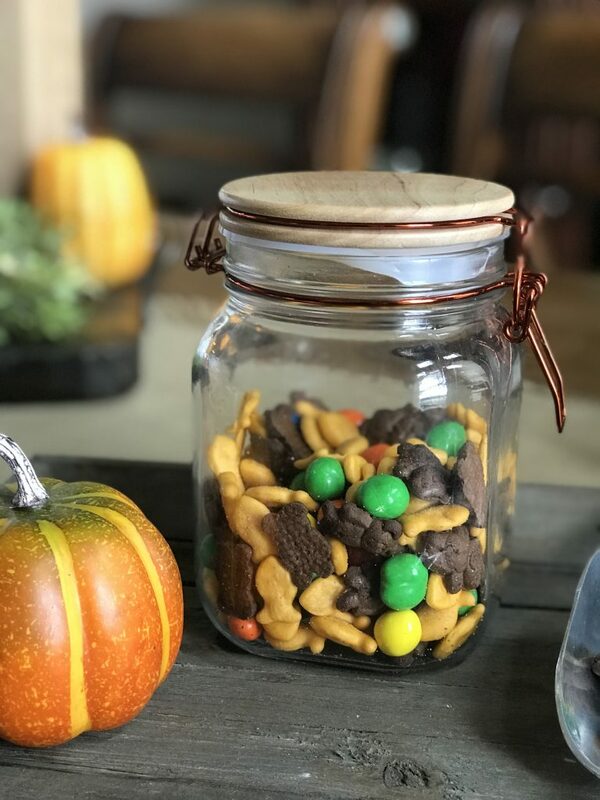 I have a confession to make about fall snacks… I cannot stand candy corn! I’m sure I’m about the only person in the world who feels that way, but it’s just too sweet for me! So when I went to get ingredients for my mix, I didn’t even consider grabbing the quintessential fall candy. Instead, I went for three simple snack-y ingredients, and then added in a yummy candy to add some sweetness and color! 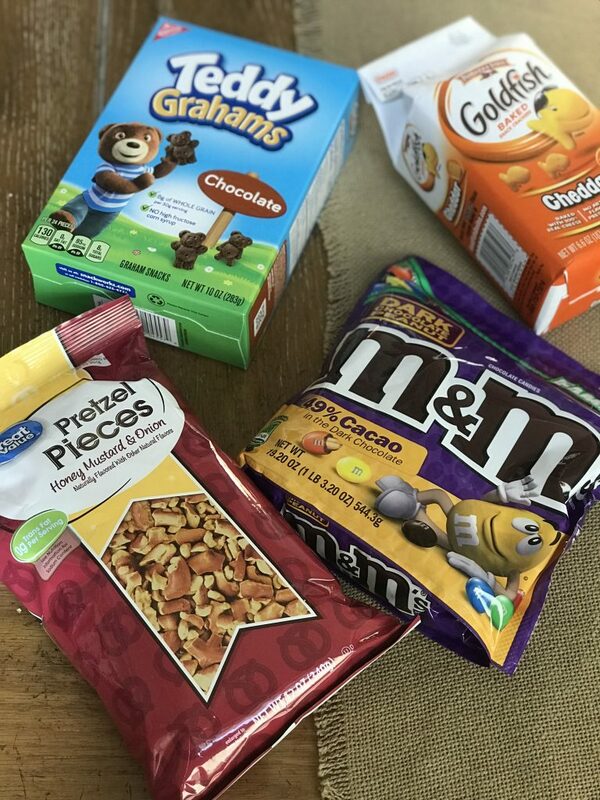 I grabbed crushed pretzels, chocolate Teddy Grahams, and Goldfish along with dark chocolate Peanut M&Ms. I obviously didn’t pay close attention at the store, because when I got home I realized that the pretzels were actually honey mustard & onion flavor, which I don’t particularly care for, so my mix ended up only being three ingredients, but for me, less is more! It’s SO simple, easy, and totally cures my fall snack cravings in the best way. And if you’re not the next Julia Child, then make your own version for your next holiday get-together! I’m always the grazer at the food table, so I’m crazy about something that’s easy to grab and go! 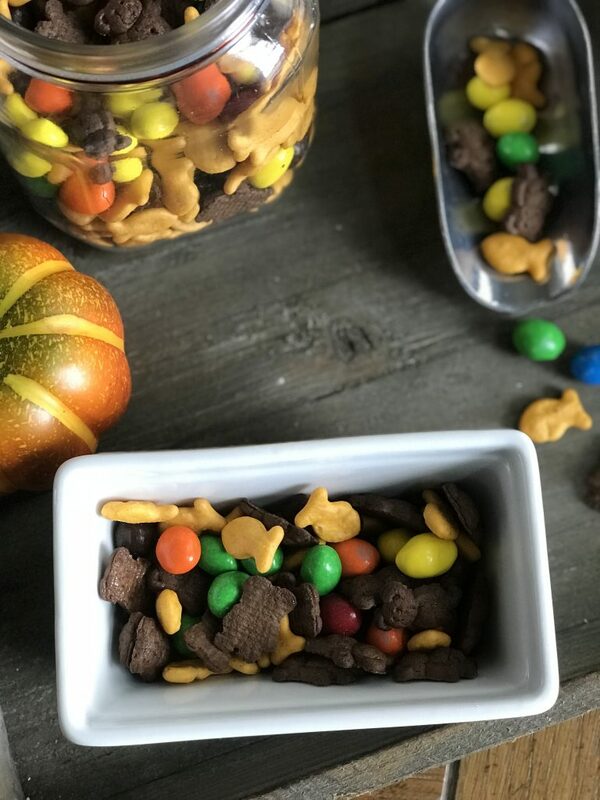 What’s your favorite fall snack mix recipe? Is there a different version that I should try before the season’s over? Let me know in the comments below!